Free shipping with $75 purchase from LostApostle. See item details below for sale terms. Worn by itself this tiny bird skull rings looks fantastic, but we designed it so that it stacks up beautifully with any of the rings in our new Stacking ring collection. The squared-off band means the rings sit perfectly next to one another and the combinations are endless. Keep it all bronze, mix up some white bronze in there - either way your finger will look awesome with a few Lost Apostle stacking rings piled high. Impeccable details and definitive Lost Apostle styling, you can be sure this ring not only looks great but feels great too. 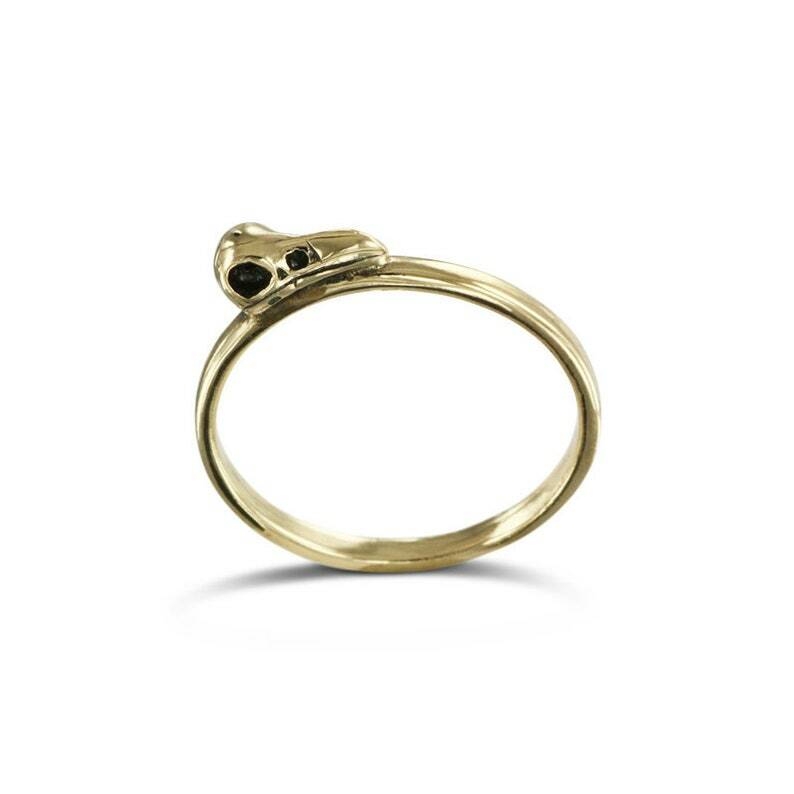 Completely hand carved and cast in the finest bronze, the ring is protected against tarnishing and comes in lots of sizes - whether you want to fly this thing solo or start a collection, this tiny bird skull ring is a perfect place to start. Who says Lost Apostle don't do dainty? Well, us apparently. Up until last week anyway. We accept payments by Credit card and Paypal. Paying by PayPal is super straight forward, and the checkout process here at Etsy will walk you through it. If you would like to pay by credit card, please follow the links to pay by PayPal, and then look for the Visa/Mastercard link on the left-hand side of the PayPal page to continue your payment with Credit Card. This will navigate you away from PayPal and allow you to complete the transaction using your credit card. Ideal if you do not have a PayPal account. If you're not 100% happy with your purchase, return it (unworn and undamaged please - worn or damaged jewelry will void the refund) within 10 days and we'll give you a full and complete refund (sorry, this doesn't include shipping) or a replacement if you'd rather. It's just the three of us here, you'll be dealing with real humans, and we'll do everything we can to ensure your complete satisfaction. We cannot refund custom-made orders sadly. If ordering a custom-made ring please ensure that you have your finger accurately sized by a jeweler to ensure a great fit. As soon as payment is received we'll ship your purchase within 24 hours (occasionally - over national holidays and situations beyond our control - it may take a little longer), anywhere in the world. Anywhere? Anywhere. We will send your jewelry by Canada Post's very efficient First Class Airmail, but please remember that delivery times can, and no doubt will, vary. Please also note that Canada Post does not provide a tracking number with their First Class Airmail service. Once it's in the postman's hands, it's out of ours, and so please allow up to 28 business days for international delivery (that's what Canada Post says anyway). It rarely takes that long but it's good to know. If you can't wait to get your hands on your new jewelry and would like us to send it by Expedited mail, courier service or any other speedier methods, please convo me (or send me a message through the "contact" button on my shop page) and I'll be happy to help. International customers also please note that we cannot be responsible for any boring customs hold-ups or import taxes dumped on the shipment. I'm afraid I can't misrepresent the value of the package either. Thanks for understanding. We always love hearing from customers once they have received their jewelry, so please get in touch and let us know it's arrived safely and what your thoughts are. I'm used to working behind a market stall and so I love the feedback! We welcome any wholesale inquiries, both in Canada and the U.S and also the rest of the world. We have retail outlets in London, UK, so if you're there please let us know and we'll point you in the right direction. All Lost Apostle jewelry is protected against tarnishing and holds up beautifully with normal wear. It's always a good idea however to remove any jewelry before swimming and exercising, and to avoid contact with chemicals and perfumes as much as possible. Looks after your Lost Apostle jewelry as you would any other and it'll look after you for years to come. Whilst we can no longer accept custom requests, we can certainly work with you if you need a different length chain, or if you'd like us to combine, say, a couple of pendants on one chain. We'll do everything we can to make sure you get exactly what you're looking for. Lost Apostle. For the Renegade, the Rebel and The Rogue. Whatever we can do to make you smile, we'll make it happen. Each piece of Lost Apostle is beautifully wrapped and shipped in our branded Lost Apostle jewelry bags, ready for gifting or keeping for yourself. It's cool, we got you covered. Absolutely - just send us a message and we'll give you all the details on our wholesale opportunities. You kidding? Every piece of Lost Apostle is designed with the lady and the dude in mind. Fellas, step right up. All orders are sent with Canada Post's First Class Airmail, which does not supply tracking numbers. Customers in Russia and Mexico - in our experience, shipping to these countries takes longer than usual, and it's not uncommon for orders to take 1-2 months to arrive. If you would like a speedier delivery, we recommend upgrading to our Expedited service. Got any more info on the history of bronze?